The Institut für Textiltechnik (ITA) based at RWTH Aachen University in Germany plans to present a range of products at the Composites Europe show. This includes a fiber-composite pressure vessel made from carbon tow prepreg, produced in the multifilament winding process. 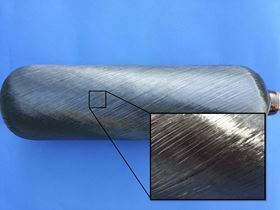 Fiber-composite pressure vessels can be used for a variety of applications, including as fuel storage in fuel cell vehicles.The vessel was produced in the multifilament winding process with machines available at the ITA, such as the MFW 48-1200, which is manufactured by the Japanese company Murata Machinery. This machine is able to process up to 48 rovings simultaneously and produces a complete fiber layer in just one production step. The institute will also be showing an automotive door panel made from biodegradable materials such as flax, hemp, and polylactide (PLA). Unlike earlier models, which were manufactured using polypropylene as the thermoplastic matrix, the ‘new’ materials are completely biodegradable, the researchers say. Finally, the institute will also be exhibiting a prototype concrete mold for the production of longboards made from carbon fiber reinforced polymers (CFRP. The prototype was developed in cooperation with the company KMB Keramischer Modell- und Formenbau GmbH and is meant to be a replacement for mold made of synthetic materials (Ureol, plate material), aluminum or steel. According to ITA, first parts are already being manufactured successfully with the mold and show the great potential for concrete forms in the production of fiber composite materials. This story is reprinted from material from ITA, with editorial changes made by Materials Today. The views expressed in this article do not necessarily represent those of Elsevier.